By Benjamin Fulford Several issues could trigger a brief, sharp war inside the U.S., in the Middle East, and possibly even in Japan this autumn, multiple sources agree. The key issue remains 9/11, a mass-murder event that remains unpunished and officially unacknowledged to this day. The 9/11 war crime was used as an excuse for the mass murder of Iraqi, Syrian, Afghan, and other peoples. Furthermore, if you dig deeper, it ties into the Kennedy assassinations of the 1960’s, the murder of Martin Luther King, as well as the December 26, 2004 and March 11, 2011 human-induced tsunami mass-murder attacks among many other crimes against humanity. …the close to 50,000 sealed indictments in the U.S. will finally be acted upon, and “among the first to be unsealed may be [former CIA director] John Brennan,” Pentagon sources say. In fact, the sources say, “They are getting unsealed after the August 7 primaries, and Hillary Clinton and John Podesta may have been Gitmo’ed.” In other words, they may have already been transferred to the U.S. military prison in Guantanamo Bay, Cuba. For example, the Rockefeller Brothers Fund is funding protesters against the construction of Canadian pipelines meant for exporting oil the U.S. and Asia, Canadian government officials confirm. Thus, there is a real fight going on between the Canadians and U.S. oligarchs on the oil front. This may be why efforts are being made to implicate Trudeau in the ongoing arrests and exposure of pedophiles. In this context, it is interesting to note that a close childhood friend of Trudeau’s was arrested on pedophilia charges recently. Four of our private investigators did the work that the journalists and the companies they work for in this country do not have the training or the discipline to perform. Thousands of man-hours went into the work you’re about to witness in these broadcast reports. What they found may not shock some of you because many folks in this country who care about America are awake and they’re watching. Our investigation into what actually happened at the Mandalay Bay Hotel & Casino on 1 OCTOBER 2018 is the definitive forensic investigation of ALL the information available to the public. As you might already suspect, the truth has been covered up. Las Vegas’ PD has botched “the narrative” and they’ve been caught red-handed in a complete fabrication and lie. The facts related to what has been released for inspection by the public tell a different story. It wasn’t one shooter. It didn’t happen only at The Mandalay Bay Hotel & Casino. The political narrative, which is what has been reported by the major journalism companies regarding Mandalay Bay, leaves no doubt, it’s not the truth. The truth is not a good business model and it’s the truth, along with the victims of the mass shooting in Las Vegas that night, which has been completely obliterated. The chain of evidence has been broken and tampered with. It’s time to ask yourselves, who benefits from this? Who had foreknowledge of what actually took place? Then ask yourselves, where is The Press? There’s only one answer: Right here & here. And guess what. We’re not done with exposing “them”. Peace in the Korean Peninsula means the Khazarian mafia is now pulling out all stops in an effort to start World War 3 in the Middle East, multiple sources agree. The result is that there is now a huge battle going on there that is likely to determine the fate of Israel and its ally Saudi Arabia, a collective we will refer to as Saudi Israelia. The battle will also determine who rules the West—satanic bloodlines, or the people. There are signs that the nuclear attack may have been Saudi Isrealian retaliation for the assassination of Crown Prince Mohammed bin Salman, the de facto ruler of Saudi Arabia. Crown Prince Salman has not appeared in public since heavy gunfire was reported inside the royal palace last week. The only person trotted out for the press when U.S. Secretary of State Mike Pompeo visited over the weekend was the fake king. However, the fog of war is especially thick in the region now, so we will not know a lot of what is going on until the dust settles a bit more. In any case, it is clear Saudi Israelia is increasingly isolated in the region, as Turkey, Iran, Egypt, Qatar, Iraq, Syria, and other regional powers line up against them. Now, the U.S. decision to withdraw its troops from Syria into Iraq is a sign to the Russians and their allies that the U.S. military will not defend Saudi Israelia from any Russian attack as long as U.S. control of oil resources in the region is not threatened, Pentagon sources say. This struggle is not limited to the Middle East, but is also raging under and above the surface in Europe, the U.S., and Russia as the old satanic bloodline families struggle to retain control of the planet Earth. 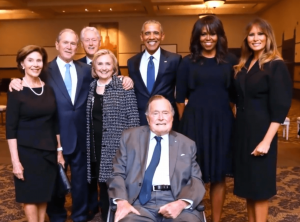 A visible sign of this epic battle was seen when French Rothschild slave President Emmanuel Macron visited U.S. President Donald Trump last week. This was captured in the photograph below, sent by Pentagon sources. At his meetings with Trump, Macron pretended to support the Iranian nuclear accord that supposedly keeps Iran from having nuclear weapons, while in fact the Rothschilds have been providing Iran with both money and nuclear weapons as part of their fanatical efforts to start World War 3, according to members of the Iranian royal family. The Iranians still have neutron-bomb-tipped missiles that were sent to them by the Bush regime, because the Obama regime refused to accept their return, the sources say. So the real battle is not about “preventing Iran from getting nuclear weapons,” as is being constantly drummed into us by the Khazarian-controlled corporate media. The real battle is between people who want real peace in the Middle East and the religious fanatics trying to start Armageddon. The nuclear attack on Syria is almost certain to be followed by retaliatory attack on either Israel or Saudi Arabia, as the fanatics, fearing for their very lives, try to save themselves by starting a world war. The White Dragon Society and their allies will try to prevent this from escalating into a nuclear inferno by continuing to systematically remove rulers in Israel, Iran, Saudi Arabia, Europe, Russia, the U.S., and elsewhere who are plotting to make this happen. The battle in the U.S. against the satanists is almost over, even though the 25,500 sealed indictments have yet to be acted on. Last week House Speaker Paul Ryan was the latest in a comprehensive list of powerful people who have been purged. Remember, George Soros, David Rockefeller, Zbigniew Brzezinski, Hillary Clinton, Barack Obama, Barbara Bush, John McCain, etc. are now out of the picture. The satanists have been trying to create the illusion that this purge is not happening by digitally reviving key people like Clinton, George Soros, and Bill Gates. Last week, for example, they recycled a veiled threat by Gates to kill millions of people with bioweapons. This sort of digital trickery does not change the reality that these people are gone. However, satanic leaders like Theresa May in the UK, Macron in France, Benjamin Netanyahu in Israel, and Angela Merkel in Germany are still in place. Removing Macron may be the next move. Here, “The National Transition Council’s Supreme Court, which is the only legitimate justice authority in France, has issued an arrest warrant for Macron and his illegitimate government,” and they hope to enforce it on or around May 5th, according to the Council. 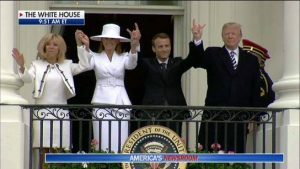 The Council notes that apart from making the satanic hand sign in Washington last week, Macron has placed a satanic symbol in the presidential office and made his acceptance speech with his head posed just below an eye on the top of a pyramid. It is interesting to note that the oak tree planted in Washington last week by Macron and Trump has gone missing, Council sources say. In the UK, embattled Prime Minister May lost a major ally last week when Home Secretary Amber Rudd was forced to resign, ostensibly over the mistreatment of immigrants. The Home Secretary in the UK is in charge of the MI5 spy service, and she was really removed because of her involvement in fake gas attack stories in the UK and Syria aimed at provoking war, MI6 sources say. May will soon be removed and replaced with 9/11 and 3/11 truther Jeremy Corbyn, the MI6 sources say. Remember, Facebook is controlled by Mark Zuckerberg, grandson of David Rockefeller. The source also says this move to control the Russian Internet is also somehow connected to a push inside Russia to make owning cryptocurrency a crime punishable by four years in jail. It is a good guess that the ongoing move to take control of Russia’s Internet is aimed at trying to manipulate Russian public opinion into supporting an end-times war. It may also be a strategy aimed at undermining the Christian revival in Russia. In any case, for now, the focus on ending constant war will be to finish the peace process in Korea, Pentagon sources say. To this end, Admiral Harry Harris will be sent to Seoul as ambassador to be military governor of a unified Peninsula, the sources say. Once the Korean issue is put to rest, the peacemaking focus will shift to Saudi Isrealia, according to WDS sources in Asia. The Gnostics probably have good reason to distrust the Rothschilds. Eric Fioril, chairman of the French Transition Council, says Macron himself is implicated in financial and other high-level crimes. The council has evidence the Macron regime has been trying to start a civil war inside France by using state-owned weapons manufacturers to funnel weapons to so-called “Islamist terrorists” in France. “Our sources let us know that some of our main assault weapon makers are receiving orders from Israel and/or Saudi Arabia and/or Gulf clients. The bill goes there, but the rifles, rockets, and ammunition are delivered to jihad groups in France in unstable suburban areas,” he notes. This is causing all sorts of problems and has put France on the “edge of a civil war cliff,” he says. The implication of this intelligence, he continues, is that it is “more than just gross negligence,” on the part of the government. As such, he continues, the white hats in the French Intelligence and Gendarmerie Intelligence cannot turn a blind eye to this activity. Fioril also notes that, “due to generalized electronic surveillance in our country, we can easily dismantle such heavily armed jihad groups on our soil in less than 10 days if we let our white hats in the IC (their equivalent of the NSA, or Computer Intelligence) and our security forces work in full cooperation. The government is committing textbook treason and the military has a legitimate reason to arrest our illegitimate government,” he concludes. What the French white hats have stumbled on, of course, is the satanic P2 Freemason plot to force a war between Islam and Christianity in order to then create a one-world religion controlled by them. In any case, the satanists’ attempt to use the excuse of a fake Syrian gas attack (the sixth such exposed fake) to attack Syria and thus start World War 3 (Armageddon) is being widely exposed as a war crime based on fraud. Even such outlets as the German state media are now reporting this. Furthermore, Special Prosecutor Robert Mueller will soon “complete the witch hunt” when he indicts Hillary Clinton. This may be a reference to the fact, that with Barbara out, she is now the most senior witch standing. “With a peace treaty formally ending the Korean War, Israel may be forced with exposure of its roles in 9/11 and 3/11 [Fukushima] to make peace with Syria by returning the Golan Heights,” the sources conclude. A peace deal in Korea would also expose many high-level criminals inside the U.S. military in Japan, according to Japanese military intelligence sources. In a handwritten note delivered to this writer, the sources say the U.S. military in Japan is now split between the people who operate the Yokota Air Base and those stationed at Camp Zama, both near Tokyo. The Yokota people support the regime of Shinzo Abe and the continued cover-up of Fukushima mass-murder crimes, while those in Camp Zama support regime change and the exposure of Fukushima truth, the sources say. Hopefully, incoming Pacific forces commander Admiral Philip Scot Davidson will clean out the war criminals once he formally assumes command. In other news last week, Turkey has officially demanded that the Federal Reserve Board return all of their gold holdings. This request is probably connected to secret negotiations concerning top CIA Turkey operative Andrew C. Brunson. Officially, Brunson is an evangelical pastor of the Izmir Resurrection Church, a small Protestant church with about 25 congregants, CIA sources say. He was arrested in the purges occurring after the aftermath of the 2016 Turkish coup d’état attempt, imprisoning tens of thousands of Turkish military personnel, civil servants, educators, academics, dissidents, and journalists, they say. No fewer than 66 U.S. senators are threatening “measures” against Turkey unless he is released. “Why would so many senators come to the aid of a humble preacher and threaten Turkey with ‘measures’ if he is just a man of the cloth?” the CIA official asks, noting that the Turks are trying to trade him for U.S.-based operative Fethullah Gülen. Gülen definitely knows too much about the satanists to be handed over, and so Brunson is “likely to be thrown under the bus,” the source concludes. In another development last week, it appears that “wearing a tinfoil hat” may not be as crazy as it is made out to be. A leak to the press by a U.S. government insider has revealed details of the energy technology used to make targeted individuals hear voices, feel pain, etc. In a final note, in what is either a sign that this writer has friends inside the electronic surveillance community or else they are getting sloppy, recently caller ID on my phone has displayed messages saying things like incoming calls are coming from “Paul” and two other people.